The arteries to the legs carry oxygen-rich blood from the heart to the thigh, lower leg and foot. The main artery to the leg is the femoral artery. It is the continuation of the external iliac artery below the inguinal ligament. The external iliac artery is a branch of the common iliac artery which is formed when the abdominal aorta bifurcates (divides into two). There are numerous divisions from the main arteries and its branches. These sub-branches form perforating and communicating arteries along its course to ensure a constant supply of oxygenated blood to all parts of the thigh, lower leg and foot. For the purpose of this article, only the main arteries and its primary branches are listed. These arteries are the most significant in circulation problems in the leg as an occlusion in one of these arteries can severely compromise blood supply to the relevant part of the leg. With an occlusion in the smaller branches, collateral flow can be established through other branches, perforating and communicating arteries. The course and branches of the femoral artery are discussed under the Femoral Blood Vessels. 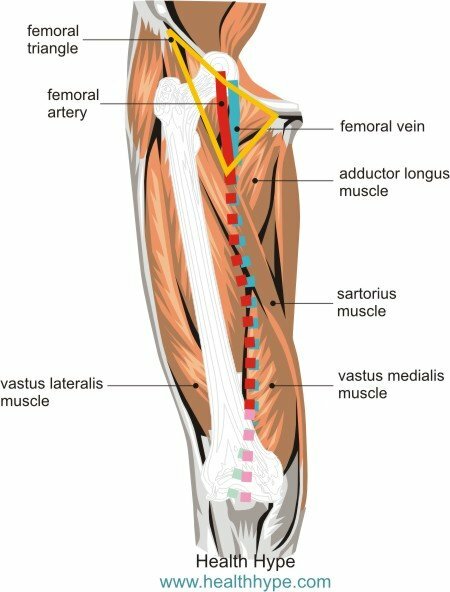 The femoral artery gives off two branches – the deep artery of the thigh (profunda femoris artery) and the medial and lateral circumflex arteries. The circumflex arteries may arise from the deep artery of the thigh or directly from the femoral artery. The obturator artery originates from the internal iliac artery and enters the medial compartment of the thigh after passing though the obturator foramen. The perforating arteries of the thigh arise from the deep artery of thigh. Three of these perforating arteries branch off from the deep artery, while the fourth perforating artery is the terminal branch of the deep artery. The anterior tibial artery continues towards the foot to become the dorsalis pedis artery of the foot. This artery along with its branches supply the dorsal aspect of the foot. The fibular artery, also known as the peroneal artery, arises from the posterior tibial artery. 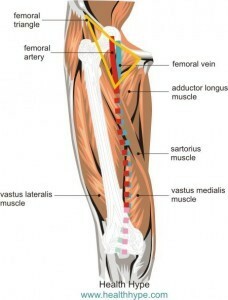 It supplies the lateral aspect of the lower leg. The posterior tibial artery also supplies the plantar surface of the foot by giving rise to the medial plantar and lateral plantar arteries.